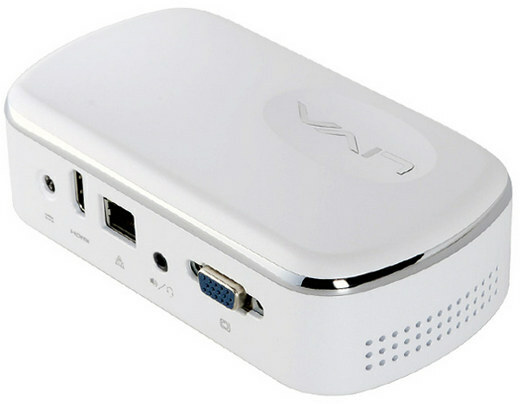 ECS LIVA was one of the first low power Intel mini PC that included both RAM and storage for less than $200 when it was first announced in March 2014. Since then there’s been a tidal wave of Bay Trail mini PCs hitting the market, and now that it’s time for Braswell and Cherry Trail lower system, ECS released LIVA X2 mini PC powered by Intel Braswell N3050 processor, that’s available for $169.99 on Newegg with 2GB RAM and 32GB storage, or $239.99 with 4GB RAM and 64GB storage. ECS says the device supports Windows 7, 8.1 and 10, although Windows 7 requires an M.2 storage device. Linux is known to run on Intel Celeron/Pentium N3000 series, so you could probably install your preferred Linux distribution too. In case like me you wonder what the yellow USB port is for, is apparently means “Always-on” even in sleep mode or when powered off, which would for example allow you to charge your phone or tablet. Anandtech got hold of an early sample, and published a review. They like it is a fanless design, but expected a bit more performance out of the Celeron N3050 processor, and when the the device is under load, temperatures may raise close to 90 degrees C, although it should not be a problem for most use case. They conclude that “despite these shortcomings, the LIVA x2 seems like a worthy upgrade to the existing LIVA and LIVA X units.” Idle power consumption @ 3.17 Watts is also the lowest they’ve seen so far, and it’s still under control under load as it rises to about 15 Watts. 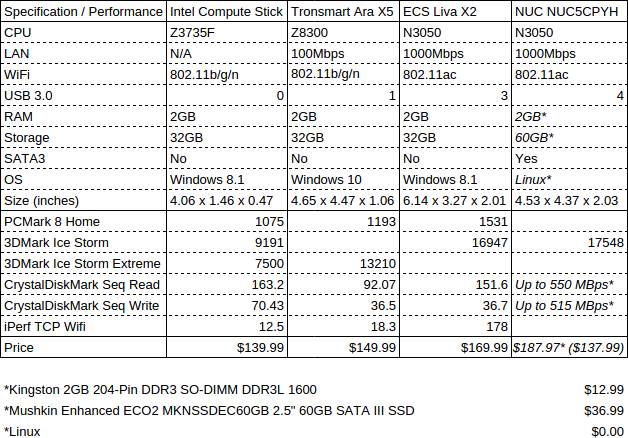 There is now quite a choice of Bay Trail, Cherry Trail and Braswell mini PCs such as Intel NUC5CPYH (Celeron N3050), Tronsmart Ara X5 and others, so Linuxium made a table comparing features, benchmark scores, and prices of such system, including ECS Liva X2. How about the MCS Cubi gets some love? The entry model sells for $100 and has the same features as the flag ship model just a different processor. I have one and its awesome. I saw the article on Liliputing a little while ago, but I skipped because the processor had a 15W TDP, and my cut off is 10 Watts. I can only find it for $140. If you have a link where people can buy it for $100, just drop it here. Is that a cut off on articles about items with processors with more than 10 watts? Because that arbitrary limit did not cut off a full article on the Phytium Mars with a TDP of a massive (in comparison) 120W.